Q. How do I know that this is the same n-acetylcarnosine eye drop that was clinically trialed by the famous Russian doctor? Q. How many drops of Can-C will I need to use? Apply two drops in the effected eye(s) two times daily, (morning and night), or as directed by a physician. Note: When applying the drops be sure the 1st drop is fully absorbed before applying the 2nd drop to prevent wasting any of the product. This can mean waiting up to 5 minutes between the first and second drop application. Q. When will I begin to notice any changes or improvements? Typically, you will begin to see signs of initial results after the first 3 months of use. Results are more significant after four to five months and even more dramatic results are achieved after six to 8 months. Because cataracts, and most other age-related eye disorders, are caused by low anti-oxidant and high free-radical activity, the regular and consistent use of low-dose Can-CTM has been shown to be and excellent, non-invasive option, for the treatment and even reversal of cataracts. Testimonials! Q. How will I be able to tell if the product is working for me? While you may notice, almost immediately, minor clarity improvements - those types of improvements are merely due to the lubricant benefits of the product and are not actually related to cataract reversal. During the first few months of use you are actually slowly changing the chemistry of the eye and are therefore not likely to see significant signs of improvement right away. Initial improvements generally occur right around the end of the 3rd month of use. Improvement in night vision is one of the first signs that the cataract is thinning. Once these initial improvements are noted you are well on your way to improved vision and the process seems to progress more quickly from that point onward. We also have reports that improved brightness of colours is what is noticed initially. Ultimately at either the 6 month point or the 12 month point you will want to have your eyes checked to determine to what degree you have succeeded in reversing your cataract. Once the optimal level of reversal has been achieved it is advised to use the recommended maintenance dose to ensure that cataract does not return. Q. My cataract is pretty bad will Can-CTM still work? Yes, however the earlier one starts the better. In clinical trials, those who had cataracts less than seven years experienced the most dramatic results. Those who had cataracts for seven to 15 years still received very good results. Those who had cataracts for more than 15 years experienced less dramatic improvements, but improvements none the less. Simply put you will want to continue using the drops at the recommended dose until the optimal level of reversal has been achieved which will occur at some point between 6 - 12 months use. Once this level of improvement has occurred it is advised to reduce the daily dose to the maintenance dose of 1 drop daily to prevent the return of cataract. Q. Are the results long-lasting? The benefits of Can-C are long lasting however if the drops are discontinued entirely the degenerative disease that was present initially is likely to return and so it is advised to continue with the maintenance dose on a regular and on-going basis. Maintenance Dose: use one drop of Can-CTM in each eye six days a week, with a one or two week break every two months. Q. Will Can-C drops burn my eyes at all? Q. Are there any potential side effects? With this formula, utilized in multiple human and canine clinical trials, there have been no reported side effects or contra-indications, even when used everyday for up to 2 years. Q. Are there any medications that conflict with Can-C? Always consult your physician and/or eye care specialist when adding a new medication or product to an existing regimen. To date there have been no medications that interfere with the effectiveness of Can-C or vice versa. It is however advised that Can-C eye drops be applied no sooner than 1 hour, before or after applying any other prescription eye drop. Q. Are there any vitamins or supplements that conflict with Can-C? Yes there are two. While in most cases taking vitamin supplements in no way conflict with the good effects of this products ability to address cataracts, there are some antioxidants that can greatly inhibit the intended result of this product. The supplements of concern are ocular support anti-oxidants as these particular supplements tend to have a remotely similar action toward addressing the problem of cataract and in actuality compete with, and then negate the superior action of n-acetylcarnosine which is far more direct in it's ability to address the problem of cataract. For these reasons the supplements that should not be taken in conjunction with n-acetylcarnosine are Lutein and Zeaxanthin as they do interfere with the cataract reversal process. However, once optimal results have been achieved and only the maintenance dose is being used Lutein and Zeaxanthin may be re-introduced as part of the overall ocular health management effort. Most other antioxidants and supplements should be continued and may certainly be of benefit to the end result. Q. In addition to Cataracts and Glaucoma, are Can-CTM eye-drops helpful for other degenerative eye-disorders? Q. Who should use Can-CTM eye drops? has used oral and/or ocular steroid medication (including eye drops) for a prolonged period of time. Q. Can I use Can-CTM to Prevent the onset of eye disorders such as Cataracts and Retinal disease? Yes, as a preventative measure and to maintain the good health of the eye Dr. Babizhayev recommends one drop into each eye daily with intermittent breaks or as directed by a physician. Q. Will my cataract come back after it is gone? Dr. Babizhayev recommends that intermittent use of N-acetylcarnosine eye-drops continue even after the reduction or reversal of cataracts because senile cataract is an on-going aging problem caused by low anti-oxidant protection, high free radical production and the process of auto-oxidative glycosylation etc. Keep in mind that the same deficiency that allowed the cataract to form in the first place will still be present when you discontinue use of the product. For over all ocular health and cataract prevention, apply 1-drop into each eye daily with intermittent breaks unless otherwise directed by your physician. Q. How long will one box of Can-CTM last? If treating both eyes 1 box of Can-C will last 2 weeks and twice as long if only treating one eye. A simple way to plan your use is to know that you will need 1 box per eye, per month. Each box of Can-C contains two 5ml vials and each 5ml vial contains approximately 75-drops. When used for cataracts, apply two drops into each affected eye in the morning and then again at night time. 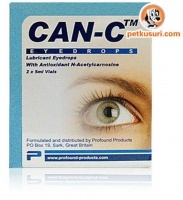 When used as a preventive measure or for maintenance purposes which is one drop into each eye daily, one carton of Can-C will last for approximately eight to ten weeks. Q. Often when I apply eye drops some will run down my face. How can I minimize any wastage? This is a very common concern; however, even though some liquid may run out of the eye as long as some of the liquid has been delivered you will be okay. Even if you have moisture on your face after applying the drops you have most likely still effectively delivered more than you think into the eye. You can however minimize any wastage with a little practice. There are two additional ways to apply eye drops if you are experiencing difficulty with the more traditional method and of course only personal experimentation will allow you to find the method that most suits you. Option 1: Gently pull the corner of your lower eye lid down and tilt your head back. Apply 1 or 2 drops into the pocket formed by your lower eyelid, but DON'T allow the tip to touch your eye or any other surfaces. Repeat for your other eye if required. Option 2: Some people prefer to apply drops this way: Close your eye, apply 1 or 2 drops to the inner corner of your eye. Open your eye and blink several times to spread the drops properly. In all cases it is very important to apply very little pressure when squeezing the eye drop bottle or a lot more will come out. Q: I saw another N-acetylcarnosine website and they said that the preservative Benzyl Alcohol is not good, is that true? Definitely not true. Benzyl alcohol has long been utilized in ocular formulations as an FDA approved preservative. In the clinical trials conducted by Innovative Vision Products, five formulations were tested with varying preservatives and sources of NAC. In the end there was one that far surpassed all expectations and parameters. Interestingly it was the formulation with the preservative benzyl alcohol in combination with a unique source and purity level of NAC. Those who are claiming that benzyl alcohol causes burning do not understand the importance of the critical pH balance of ocular formulations. It is the incorrect balance of pH that can result in burning with some ocular formulations and not necessarily the preservative. We have absolutely no complaints of burning with our product in fact quite the opposite, which is why a large percentage of our customers use Can-CTM for dry eye syndrome, contact lens use and for eye strain relief. Remember it is this patented formulation that was tested over time and proven in a clinical controlled environment to reverse cataracts and resulted in no negative side affects. Unfortunately there are a few companies who continue to make attempts to circumvent Dr. Babizhayevs patent to avoid paying royalties. Not only are they not utilizing the proprietary source of NAC which is critical to the effectiveness of this formulation, they have made changes to one or two of the excipient ingredients in their attempts to get around his patent. Again to be sure that you have purchased the approved formula look for the following statement on the label of any product you have purchased. "N-acetylcarnosine patented by Innovative Vision Products."